Whether your favorite mechanic is retiring or you’re new to town, finding a new auto shop can be tricky! Once people find a mechanic they can trust, the relationship is not one that is easily replaced. When you are in search of a new auto shop, there are a few things you can do in order to ensure you find one you’ll enjoy in the future. First, get recommendations from people in the area. While internet searches can be helpful, they also can be deeply flawed. There are auto shops with inflated or false reviews making them appear to be better than they are, and there are also auto shops that are great with very few reviews. It just depends on who decides to comment! Go around to your local friends or coworkers and see who they would recommend. Next, decide what features of an auto shop are most important to you. Do you want an auto shop that does everything from tires to specialized custom work? An auto shop that works with specific models or brands of cars? A large, expansive business or a small, personalized one? Determining the type of auto shop you are looking for can help you narrow the search. Finally, make sure you make a personal visit, preferably for something simple. Think of this as the interviewing process for your new auto shop. If you go in for an oil change or a routine maintenance check, you’ll be able to get some first-hand experience of the auto shop in a non-emergency situation. 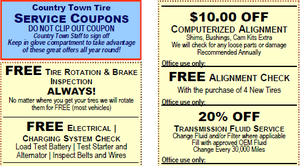 At Country Town Tire & Auto Service Center, we would love to be your auto shop of choice. Come see us today!